Being a professional, especially a professional researcher, isn’t easy. For Sunghwan Kim, he believes the best option is to enjoy the challenges as they come, because eventually it will all pay off. Kim, a researcher in pavement science and engineering, will receive the 2016 Professional and Scientific Outstanding New Professional award this fall at the University Awards Ceremony at Iowa State University. This award has come to represent ISU staff members who have gone above and beyond in service to ISU, their careers, their co-workers, and the betterment of themselves. Kim is no stranger to ISU, having received both his MS and PhD degrees in civil engineering here. 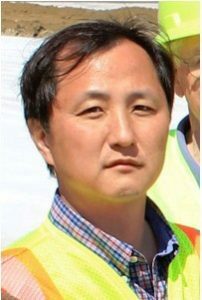 His research specialty is in pavement science and engineering, including paving materials, pavement design and analysis, and pavement assessment and evaluation as well as the evaluation of various emerging technologies to achieve sustainable pavement systems. He has been involved in over 10 competitive funded research projects to date as well as authored/co-authored numerous articles, reports, and presentations. After his graduation in 2006, Kim continued at ISU as a research associate under the mentorship of Halil Ceylan, the director of the Program for Sustainable Pavement Engineering & Research (PROSPER) at ISU’s Institute for Transportation (InTrans). However, it wasn’t until 2015, when an opening at InTrans “paved the way” for Kim, who is now an assistant scientist and associate director with PROSPER. In addition to his research duties, Kim’s service activities include coordinating with sponsors to secure space and time for research meetings, driving students to attend workshops/annual meetings even under harsh weather conditions, and staying up late into the night to assist with student-oriented lab activities. “As someone who never likes to keep his teammates and project-mates in suspense, Kim is fully accountable and demonstrates a strong sense of team spirit and interpersonal effectiveness with his colleagues,” said Ceylan.